After completing his training, CCI student Duncan Susag decided to jump right in and start doing concrete full time. Prior to taking the Ultimate course with us he’d gotten his business license, and shortly after arriving home he started making the preparations to make concrete his main endeavor. Three years later he’s still working with concrete full time and has added a gorgeous Tacoma WA showroom to delight and inspire his clients. This gorgeous green concrete table doubles as a magazine rack. Duncan loves getting his hands dirty and being a major part in the creation of each piece he produces. He has part time help at times, but the majority of his work he does alone and likes it that way. When talking about expansion he mentions that he wants to stay small, “With a larger shop you’re managing people, not getting your hands dirty.” He hopes to spend his concrete career elbow deep in concrete, creating art and delighting clients with his work… and with pieces like these, who wouldn’t be delighted? This beauty of a desk is Duncan’s own desk, found in his office. Including his company logo makes this piece extra special. Duncan has found that one of his biggest challenges is building clientele and educating potential customers about the benefits of concrete. This is one reason why his showroom is such an advantage. Unlike many concrete countertop showrooms, Duncan has chosen to combine retail, ready to own pieces with his countertop samples. Clients can come in and see the possibilities of concrete as they walk through his displays of stunning modern tables and unique artistic pieces. 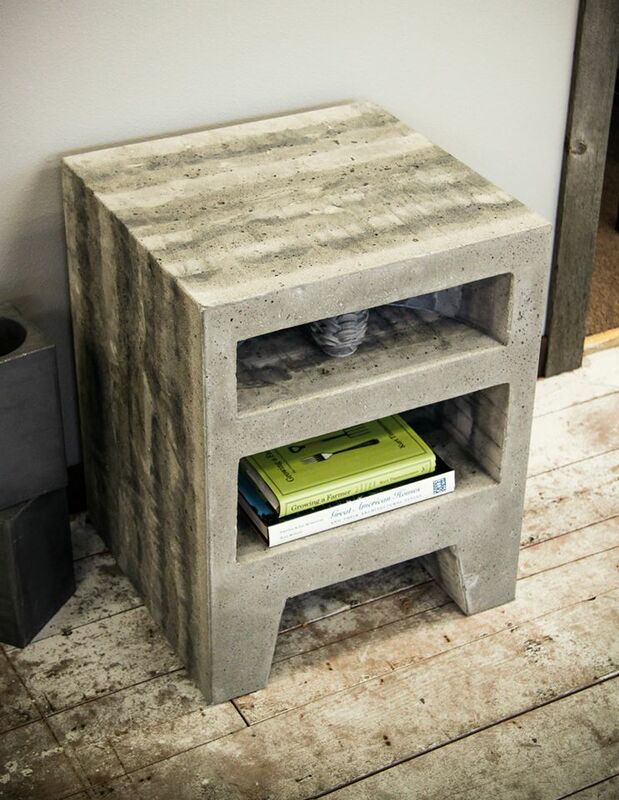 Duncan doesn’t just teach about concrete with words; his showroom is concrete proof of what he can do and how this medium can be used to beautify and accentuate homes and businesses. Speaking of his showroom Duncan said, “The furnishings and artistic offerings are my creative outlet… My idea was to create some pieces that would show the uniqueness and versatility of concrete. Clients often come in to look at color samples and see the full potential of concrete and their mind is officially blown!” Why limit concrete to just countertops? Wood and concrete combine to create this hardworking table available in Duncan’s Tacoma showroom. 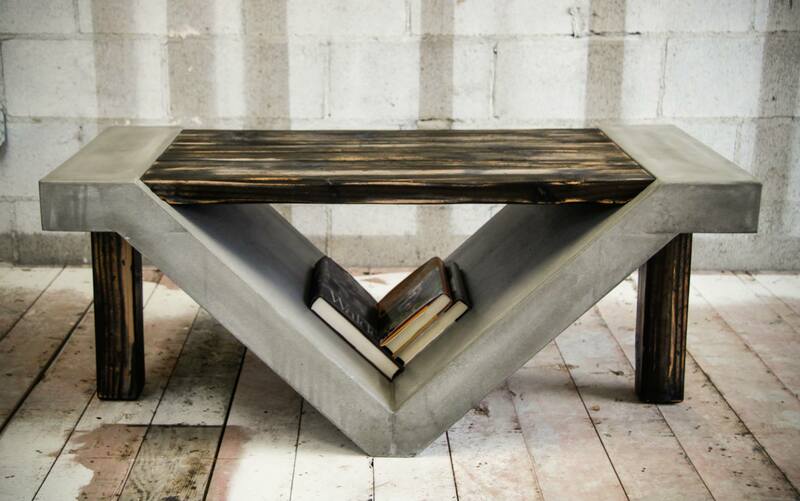 The slanted storage space beneath this table is perfect for tucking away books and magazines. As he was getting started he relied on the skills he learned with CCI. His secret to success is simply listening to the things he was taught and applying them. His training gave him a solid foundation on which to build all aspects of his concrete business: marketing, promotion, and of course the actual concrete construction. 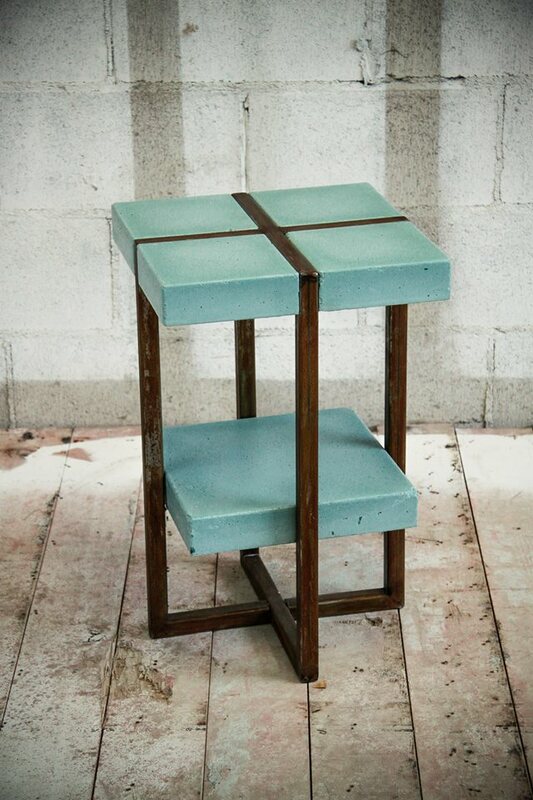 This small table makes quite the impact on display in Duncan’s showroom. 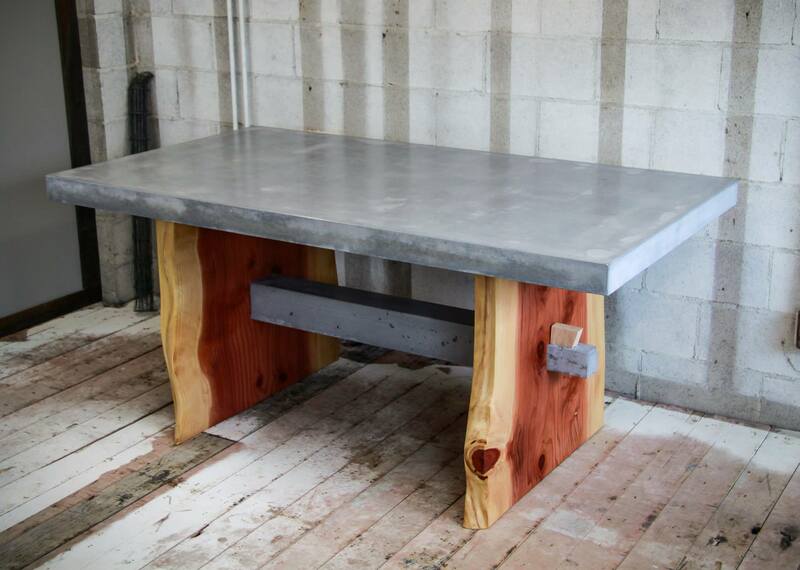 For Duncan creating concrete countertops isn’t just about creating works of functional art, he also focuses on the environment and his local community. He says, “Concrete countertops and other items we produce are widely considered a green product and environmentally friendly product. I absolutely focus on staying true to that. I have found local resources for very nearly all of the products I use.” In fact, he ships in only scrim and sealer. All of his waste is disposed of locally through a company that recycles concrete, melamine, and foam waste for landfill layering. Concrete doesn’t just make amazing countertops; this side table is pretty special too. In Duncan’s showroom you won’t just find countertop samples. He also has a passion for creating functional concrete furniture pieces, many of which are his own designs. 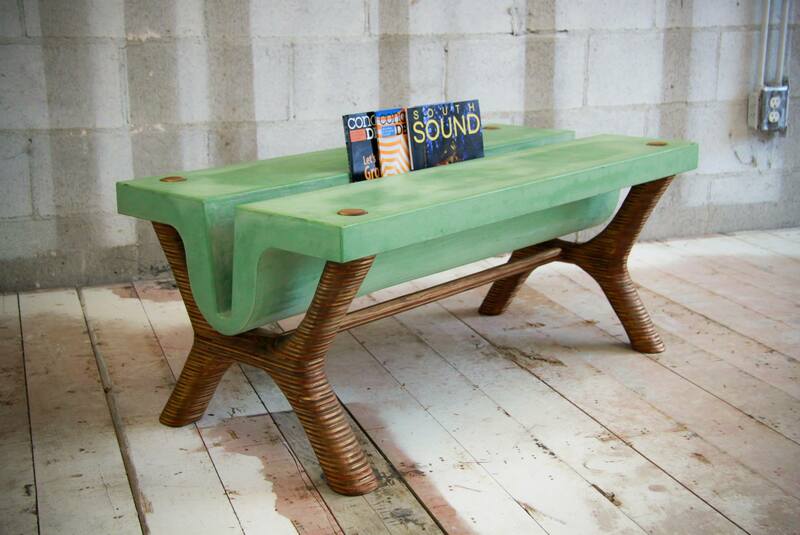 He’ll see something inspirational in a home magazine made from other mediums and will work to find a way to make something similar in concrete. His gorgeous pieces are available for sale in his showroom, which doubles as a gallery for ready to own concrete pieces. 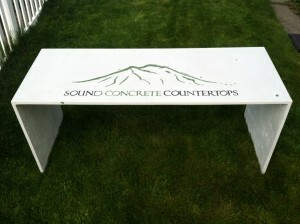 His website, www.soundconcretecountertops.com serves as an online gallery and showroom. Thank you Duncan for sharing your beautiful work with us!